We’re pretty sure that everyone wants to enjoy the outdoors bug free, and everyone’s go to solution is a store bought brand off the shelf at their local store. Which may work for a few hours, or repel the insects but they all seem to come back. 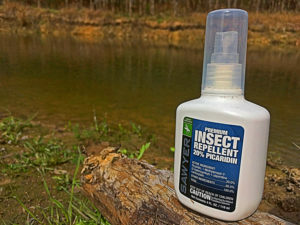 Sawyer Products are becoming a heavy hitter in the insect repellent game. They strive to not only repel insects of all kinds but also KILL said insects. So if you truly want those insects dead and gone for good, then Sawyer’s Picaridin and Permethrin line of Insect Repellents need to find their way into your home. Picaridin and Permethrin can sound intimidating to some, and parents are always monitoring what they expose their children to. So in this article we are going to break down the differences in both Picaridin and Permethrin. An effective alternative to DEET that’s great for the whole family, Sawyer Picaridin is also safe for use during pregnancy. It’s considered to be the repellent of first choice by the Public Health Agency of Canada’s Canadian Advisory Committee on Tropical Medicine and Travel for travelers 6 months to 12 years of age. Picaridin will not harm or damage plastic or synthetic coatings. It won’t damage your fishing line, firearm finishes, sunglasses, watch or other outdoor products. Picaridin has been available since 1998 in Australia and Europe (and happens to be the best selling insect repellent but was introduced to the United States only 2005. Picaridin is a perfect balance of efficacy, safety and user-friendliness. It repels a wide variety of pests including mosquitoes, ticks, biting flies, sand flies, gnats, chiggers, and midges. It is the longest lasting repellent with up to 14 hours of protection against mosquitoes and ticks and up to 8 hours against a variety of flies, chiggers and gnats. It’s non-greasy, has a pleasant low odor and won’t damage plastics of synthetic coatings. All these factors combined makes Picaridin the optimal topical repellent for the entire family. Picaridin is also known as Saltidin®, KBR 3023, or Icaridin depending on the country in which it is referenced. The World Health Organization (WHO) recommends the active ingredient Icaridin as product of choice for malaria prophylaxis. It is registered in over 40 countries worldwide. Picaridin’s efficacy with mosquitoes is quite impressive, after 10 hours, the efficacy of the Saltidin®-solution (Picaridin) remains at 99%. 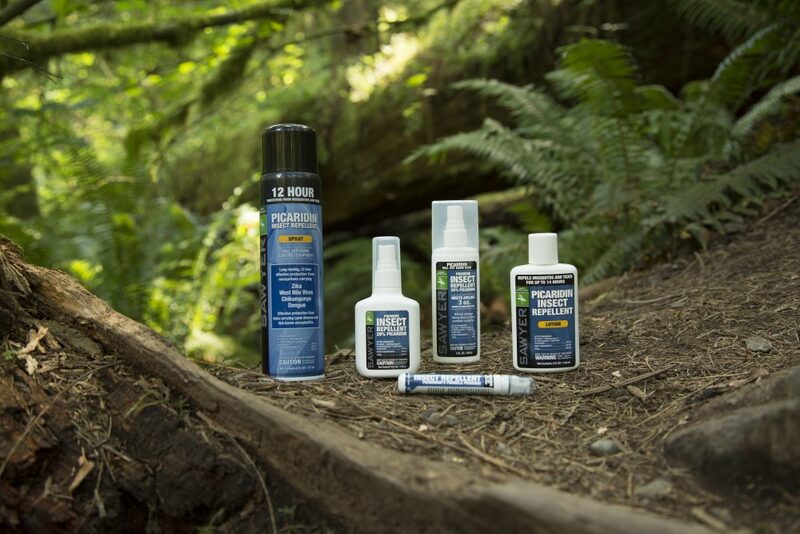 When it comes to ticks, Picaridin’s efficacy with a 20% concentration resulted in 2.5 hours of efficacy 5 times over DEET’s efficacy of just 30 minutes. Sawyer offers their Picaridin repellents in a 20% Lotion which has up to 14 hours of protection from mosquitoes and ticks, including mosquitoes carrying West Nile Virus. Repels biting flies, stable flies, black flies, gnats, chiggers, and sand flies for up to 8 hours. Sawyer also offers Picaridin repellents in a spray option as well. Offering 12 hour protection from mosquitoes and ticks, including mosquitoes carrying West Nile Virus. The spray repels biting flies, stable flies, black flies, gnats, chiggers, and sand flies for up to 8 hours. Permethrin was discovered in 1973 and is on the World Health Organization’s List of Essential Medicines, the most effective and safe medicines needed in a health system. 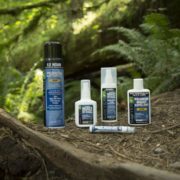 For use on clothing, tents, sleeping bags, and other outdoor gear, Sawyer Permethrin is more than just an insect repellent — it actually kills ticks, mosquitoes, chiggers, mites, and more than 55 other kinds of insects. Permethrin is also effective against the Yellow Fever Mosquito, which can transmit the Zika Virus. Using it on outdoor gear also helps reduce the mosquito population in your camp and prevents ticks from attaching to you. 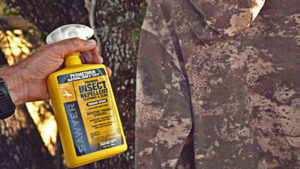 In addition to clothing and accessories like hats and waders, Sawyer Permethrin is ideal for treating backpacks, tents, camp furniture, hammocks, mosquito netting, luggage, and even bed sheets. Since mosquitoes are better hoppers than flyers, adding more Permethrin-treated landing surfaces around you will improve your protection. Treatment of non-washable items will be effective for up to 42 days of exposure to sun and air. Maximize protection from mosquitoes and ticks by combining Permethrin with Picaridin, an effective and comfortable topical repellent. Unlike topical insect repellents applied to the skin, Permethrin is applied to clothing and outdoor gear material, bonding to the fabric fibers for up to 6 weeks (42 days) or 6 washings. When a tick, mosquito, or other insect comes into contact with Permethrin, it absorbs a dose that will either repel or kill the insect. The synthetic version of pyrethrum (a natural insecticide derived from the chrysanthemum flower), Permethrin is non-toxic and registered for use by the U.S. EPA. To apply, spray Permethrin directly onto clothing and gear with a slow sweeping motion, keeping the bottle about 6 to 8 inches away and treating each side of the garment for about 30 seconds. Sawyer Permethrin Insect Repellent can be applied to dogs and help control mosquitoes, ticks, and fleas for 35 days. Official application instructions for use on dogs can be found at sawyer.com/dogs. So the next time your planning a camping trip, vacation, picnic or even just working in your yard, head over to your local Bass Pro Shops, or Cabela’s and pick up some Sawyer Products. We hope this article has informed you on the wonderful benefits of both Picaridin and Permethrin and changes the way you defend yourself, gear, and loved ones from disease and those pesky insects.